20110723 - Up in the morning and J and I packed up the car and headed to John Bryan St Park. We got there and the Scouts that spent last night here were at the Air Force Museum in Dayton. 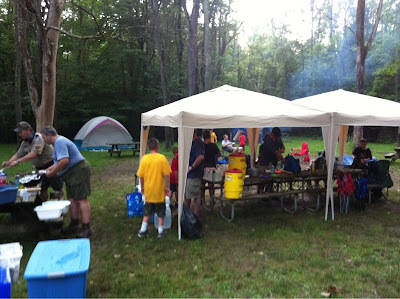 So we pitched our tent in the extreme heat and headed into Yellow Springs OH to check it out. We found some unusual stores there and a Subway where we picked up lunch. Back to the camp site to eat and it POURED! We sat under the shelter and watched it rain. 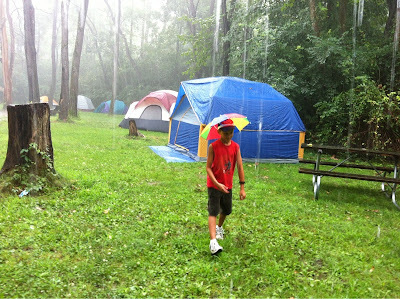 Soon the rain stopped and the other Scouts arrived and the boys were off playing it the woods. The rain didn't cool things down any, it just got stickier... Yuk! We had a good dinner and then tried to make a snare trap but gave up and went geocaching. We found one but not the other, it was too dark. 20110731 - Back Pack Bigger? 20110730 - Grant's First 'Dad and Me' Day!! 20110718 - Columbus or this guy?